An NHL goaltender has the weight of the world on their shoulders. A good performance from a team’s goalie has the power to make or break a game, a responsibility felt in no other position in sports. To have good games here and there is one thing, but to be consistently exceptional is another— the goalies on this list have earned their spots in the ‘Top 5’ for being among the few who impress year after year. 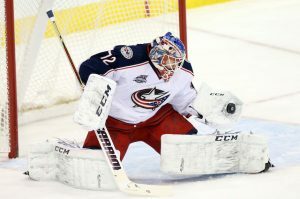 Sergei Bobrovsky started his career with the Philadelphia Flyers, and was eventually traded to the Columbus Blue Jackets for the shortened 2012-13 season. He led the Jackets to a playoff berth that year, falling in 6 games to the Pittsburgh Penguins. Columbus had a rough stretch of years after that, missing the playoffs for 3 straight seasons before finally making it again last year, in which they set a franchise record for wins and Bobrovky had a career season. Although they would lose out again to the Pens, “Bob” won his second Vezina trophy with Columbus as the league’s top goaltender, winning 41 games and posting an incredible .931 SV%. Even in years of losing, Bobrovksy has proven to be a solid, top goaltender in the league, and the 28-year old shows no signs of slowing down headed into his prime. Since being shipped away from the Edmonton Oilers, Devan Dubnyk has found sustained success with the Minnesota Wild. 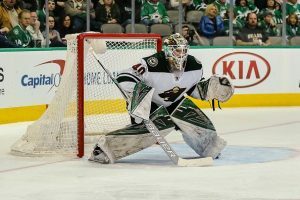 In 2014-15, after ending up with the Wild at the trade deadline, Dubnyk almost single-handedly salvaged Minnesota’s season, and proved himself to be a lights-out starter. He has followed up the past two seasons with exceptional play, winning 40 games this past year. Although the Wild have not had the playoff success they hoped for and were knocked out in 5 games by the St. Louis Blues this past year, Dubnyk was stellar with a 1.86 GAA and .925 SV%. The 31-year old Dubnyk is in his prime, and showing it every night and every game. He can only hope for more goal support to back up his extraordinary play. 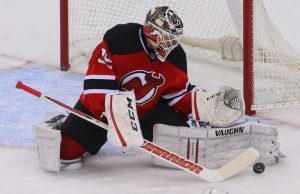 Cory Schneider has spent most of his career under the radar, overshadowed by controversy in Vancouver, and out of mind with the New Jersey Devils. Therefore, it may be easy to overlook just how good of a goalie Cory Schneider is. Since he was acquired by New Jersey in 2013, he has quietly had some amazing seasons, albeit missing the playoffs in every one of them. In both the 2014-15 and 2015-16 seasons, Schneider won 25+ games and had a SV% over .920. His GAA was low to add, and playing for a team with one of the poorest goals per game rate in the entire league, it had to be. Schneider had a down year last year, winning only 20 games and posting a 2.82 GAA and .908 SV%. However, with the addition of first overall pick Nico Hischier up front and some retooling to the Devils roster, Schneider may get the help he so desperately needs to enjoy more success than he has already had individually. Carey Price is considered by many to be the best goalie in the world. He consistently performs outstandingly and proves himself year after year to be one of the best around today. He won the Vezina trophy as the league’s best goaltender in the 2014-15 season, in which he won 44 games and posted a 1.96 GAA and .933 SV%. 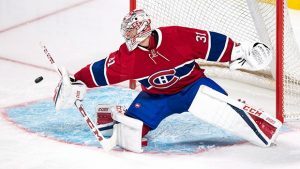 To have a sub-2.00 GAA and a SV% over .930 in 66 games played is a remarkable feat not many goalies will come close to in their lifetime— and Carey Price does it every year. This past season he won 37 games and posted great numbers once again. Although his Montreal Canadiens were bested by the Ottawa Senators 4 games to 2 in this year’s playoffs, Price posted an incredible 1.86 GAA and .933 SV%. He clearly is an elite goaltender and has many years left in his prime to see if he can win the only thing he hasn’t— a Stanley Cup. 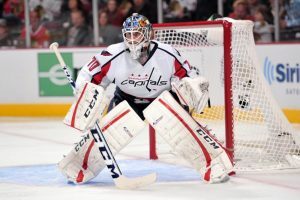 After the Washington Capitals missed the playoffs in the 2013-14 season, I concluded that Braden Holtby was not the answer. Maybe it was then-backup Michal Neuvirth, maybe it was someone else— but not Holtby. Since then, Holtby has posted 3 straight 40-win seasons, won a Vezina trophy as the league’s top goaltender, and a William M. Jennings trophy for being the goaltender on the team with the fewest goals allowed. Holtby has improved his GAA every consecutive season since 2014-15, climbing down from 2.22 in that season to 2.07 in 2016-17 and improving his SV% as a starter to a career-high .925. In his career, Holtby has amassed 191 wins in 307 games played, a .602 win percentage, and has career numbers of 2.31 GAA and .922 SV%. The only slight against Braden Holtby’s resume is the same one against his team— he, like his team since the beginning of the Alexander Ovechkin era, has never made it past the second round of the playoffs. However, in 59 career playoff games, Holtby sits just below a .500 win percentage at 29-30, and has stellar numbers: a 2.00 GAA and .932 SV%. Some things are out of a goalie’s hands, and for Holtby, like the other goalies on this list, all he can hope is that things come together and he can overcome his challenges. Still, a career to date as impressive as Holtby’s is enough to cement his position as the top goaltender in today’s NHL.